Riding Long Dead Horses (Rider Three), porcelain and terra cotta, 2018. Strippen Een Vis (Gutting the Fish), detail. 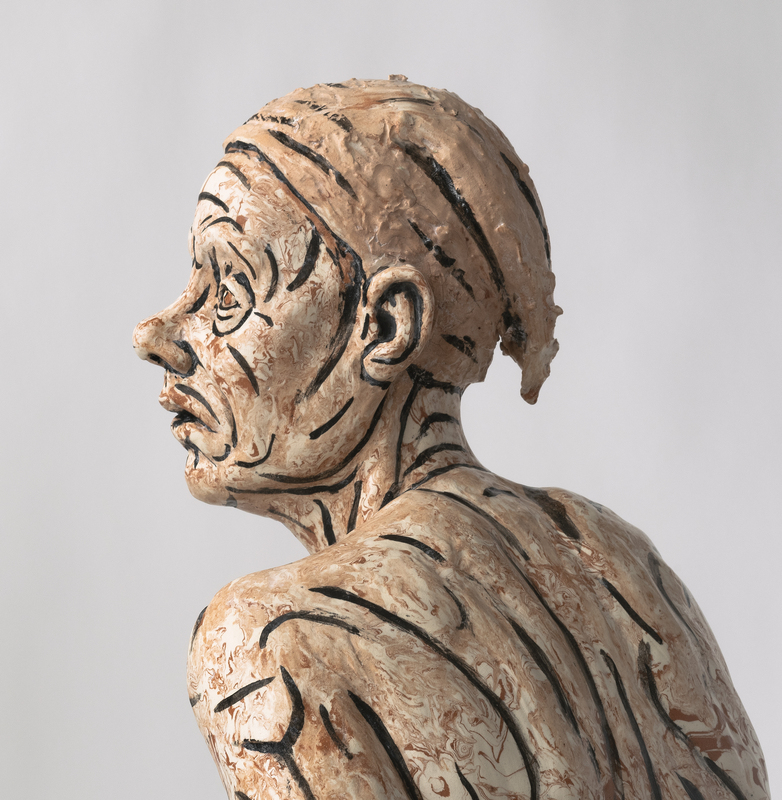 Strippen Een Vis, detail, 45"x27"x28", ceramic. Riding Long Dead Horses (a trio of half-life size figures) was created in response to our government’s restrictions on immigration and travel. My imagery was filtered through my own experience of growing up in the American West, with its mythologies of free movement and independence. My riders are female and their horses have long disappeared. What has not disappeared is the desire to keep going, to continue looking for a better place. 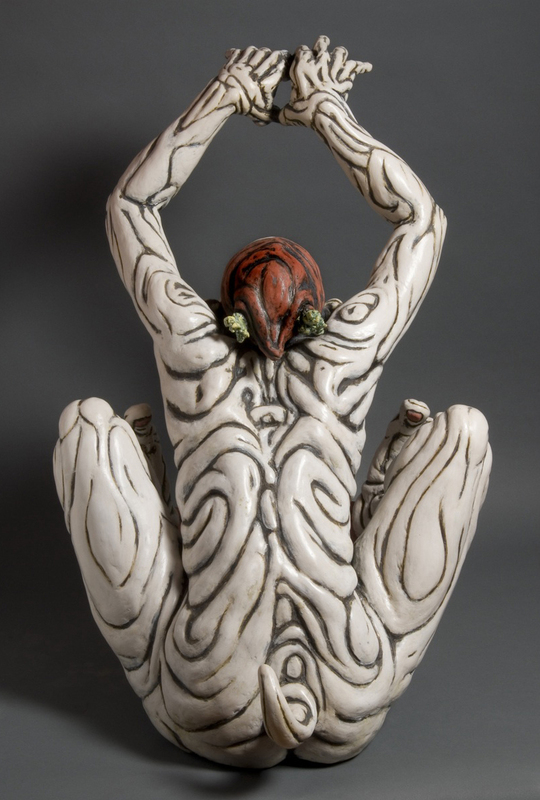 I created the Riders for an international exhibition of ceramic artists that I curated in the spring of 2018 at the Community College of Baltimore County's Essex Gallery. 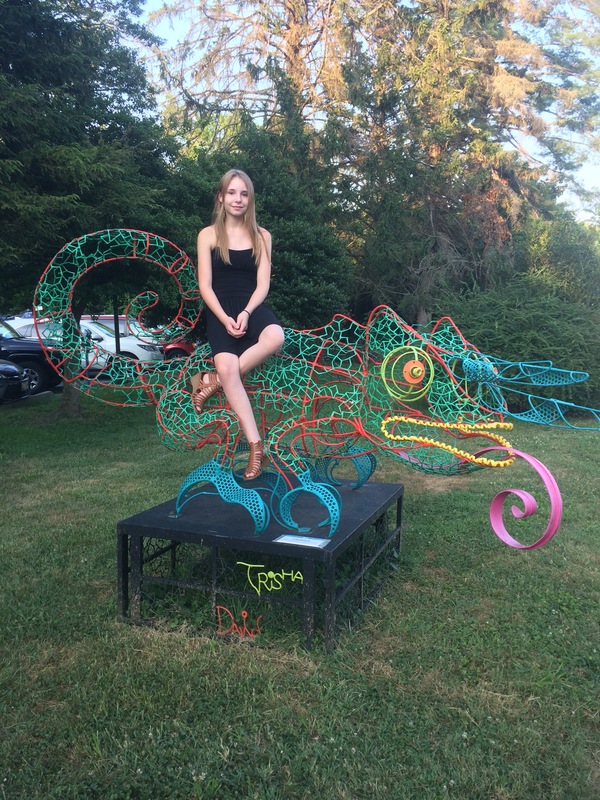 The Riders were then given a solo exhibition at Baltimore Clayworks in the summer of 2018. All the Riders (including their saddles) are hand built with mottled clay made from wedging together porcelain and terra cotta. Eah figure is approximately 27-28" long. 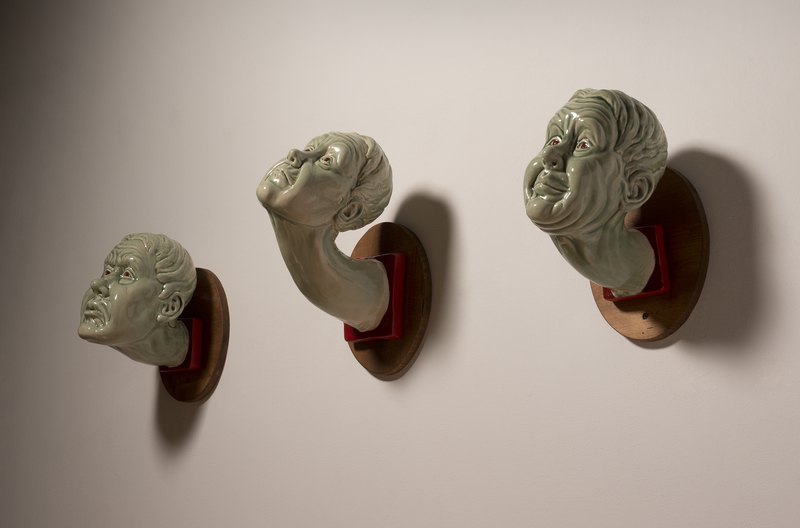 This past fall, during the Kavanaugh hearings, I began sculpting a new group of heads: The Slander Series. I was thinking about the cost of speaking out and the pressure to be silent. I hope to have five heads made by spring, a mute chorus of protest . Riding Long Dead Horses (Rider 3), porcelain and terra cotta, 2018. Riding Long Dead Horses (Rider Three), detail. Riding Long Dead Horses (Rider 1), porcelain and terra cotta, 2018. 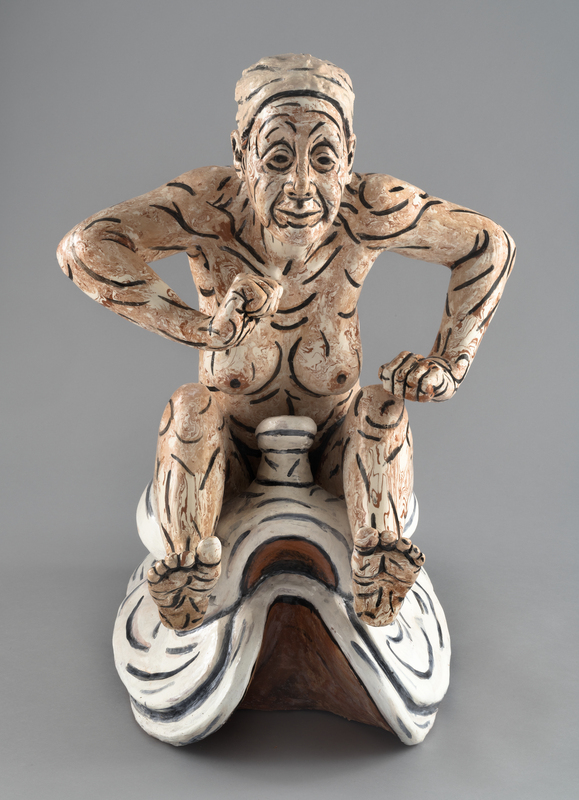 Riding Long Dead Horses (Rider 2), porcelain and terra cotta, 2018. Slander, But It's Truth#2, porcelain and terra cotta, 2018. Slander, But It's Truth #1, porcelain and terra cotta, 2018. 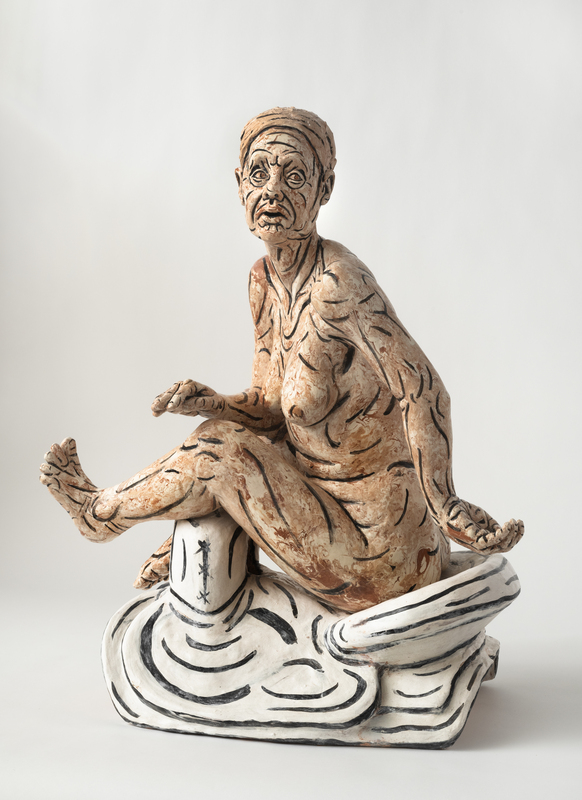 Slander, But It's Truth#1, porcelain and terra cotta, 2018, side view. 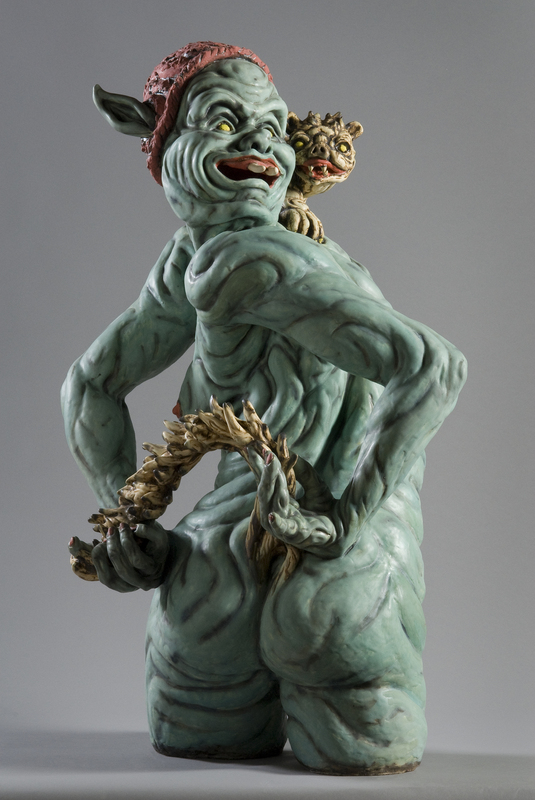 This 2016 life size porcelain figure began as a bit of primeval fantasy. 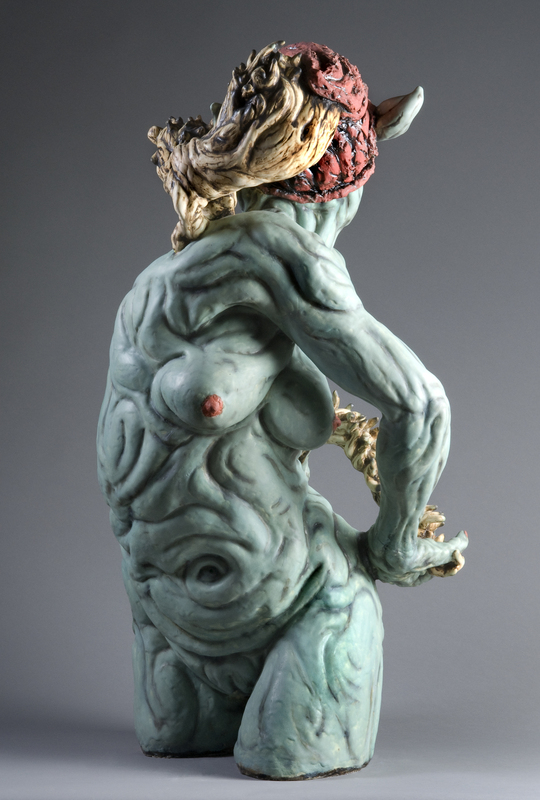 I wanted to sculpt a woman in nature, focused on a task. So often female nudes are placed in natural settings for voyeuristic pleasure, but I wanted my female to be more utilitarian, more pragmatic. The figure's gesture is a pantomime of gutting a fish. I grew up fishing the rivers of western Colorado. I was trained to give a trout a killing blow to the head and cut a delicate line up its belly with a knife before washing out its guts in the river. This is the figure's task, but she looks up from her activity. I imagine that she is slightly irritated at being interrupted by a viewer. The fish held between the figure's legs becomes a sly stand in for a phallus. The figure is independent and capable, but a little annoyed. This is my reading of the work, but viewers are free to create their own interpretations. As for the color and surface of the piece, I was looking at Dutch and Flemish painting. The surface was created through layers of colored ceramic slips and stains. 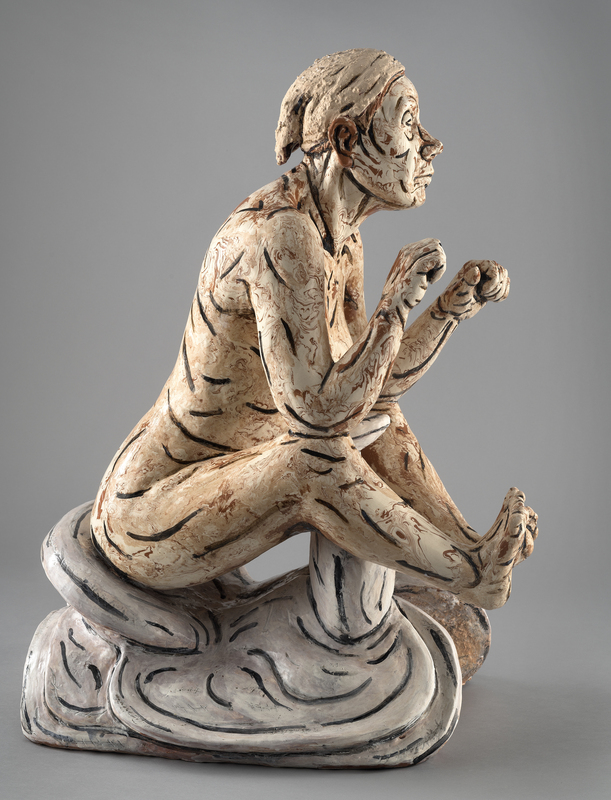 After firing, the surface was further embellished with varnish and pigment. Dimensions: 45" x 27"x 28." In the summer of 2016, I found myself in the studio in the midst of a presidential election marked by vulgarity and divisive rhetoric. I sculpted both the Green and Yellow Heads to register some of the emotions that I was feeling. The election year spectacle inspired wrinkled brows of incredulity and widened eyes of horror, which were dutifully recorded in the Green Heads. The three Green Heads are approximately life size and built in porcelain. The finish is a celadon glaze. I used bright red underglaze for the contrasting pupils. 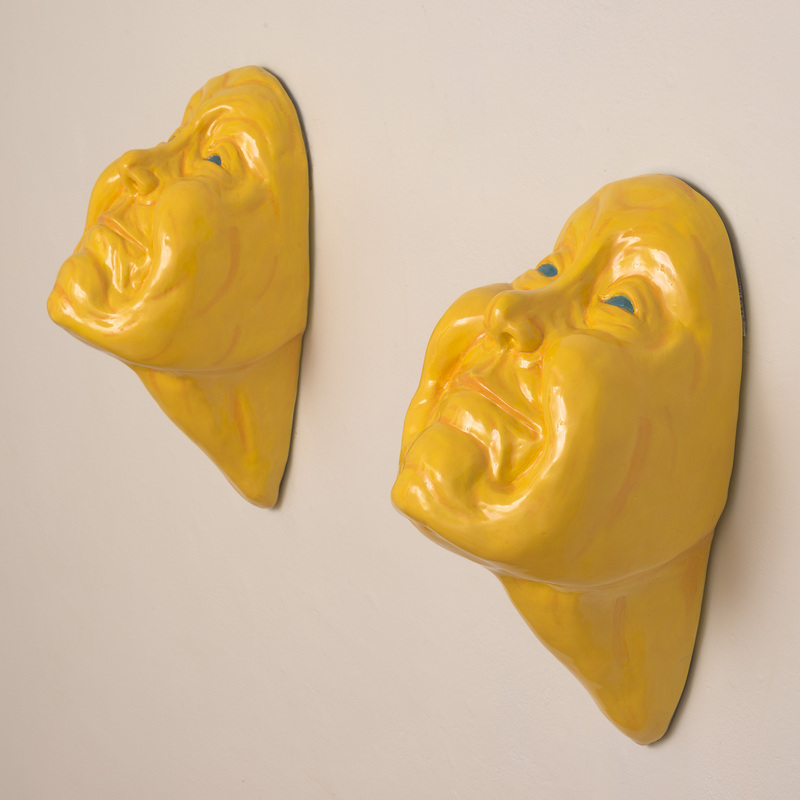 The second series, The Yellow Heads of Happy Idiots, is about self-censorship and trying to keep a positive facade during turbulent and upsetting times. I am a teacher, and my job demands more than a bit of self-censure and sunny appearance. 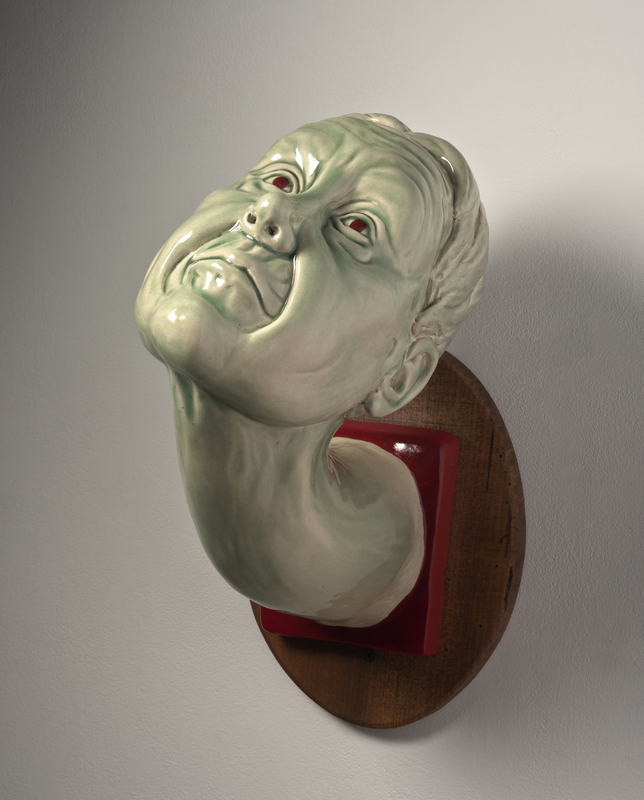 I began this series by making a 3-D scan of my head in a pose with a constricted smile. I then sculpted an original work, referencing the scans and a 3-d printed plastic model. My sculpted head was larger than life, and I exaggerated some features for the increased scale. Once this sculpture was created, I poured plaster over it to make a press mold so I could make copies. I have made three nearly identical faces from the mold. Each Head is 15"x 9"x 8." The Yellow Heads tie into our culture of the selfie. I chose a low fire white clay and a bright yellow glaze for the surface in order to mimic the yellow of popular emojis. I soon discovered that viewers liked to pose alongside these heads and take portraits. 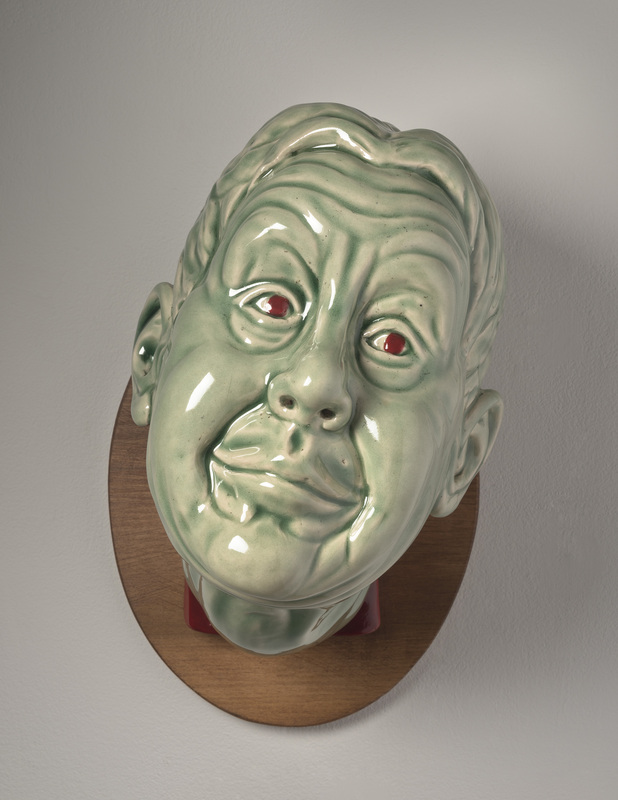 As part of the project, I have been creating my own selfies with these grimacing heads. The three heads displayed together. Each is life-size and made of porcelain. When confronted by something both ridiculous and frightening, the first response is often to look to the heavens for explanation. Porcelain with celadon glaze. This face hovers somewhere between incredulity and resignation. Porcelain and celadon glaze. A detail of two of the three heads. Each Happy Idiot is 16"x9"x8." 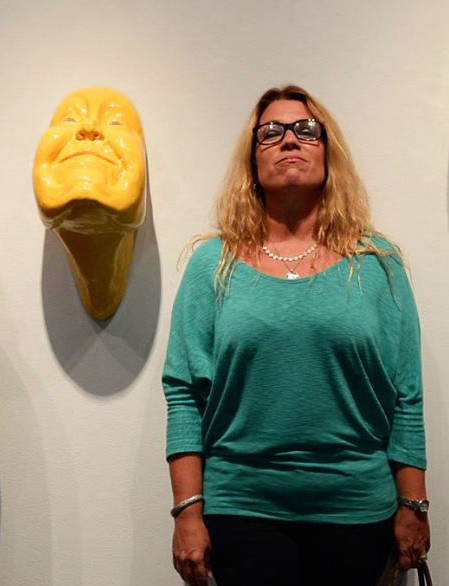 I display the Yellow Heads of Happy Idiots with enough room for people to stand between them. I've found that folks like to take selfies with the heads, and I want to encourage this tendency. This is a detail from a photo taken at an opening by my friend Gail Burton. 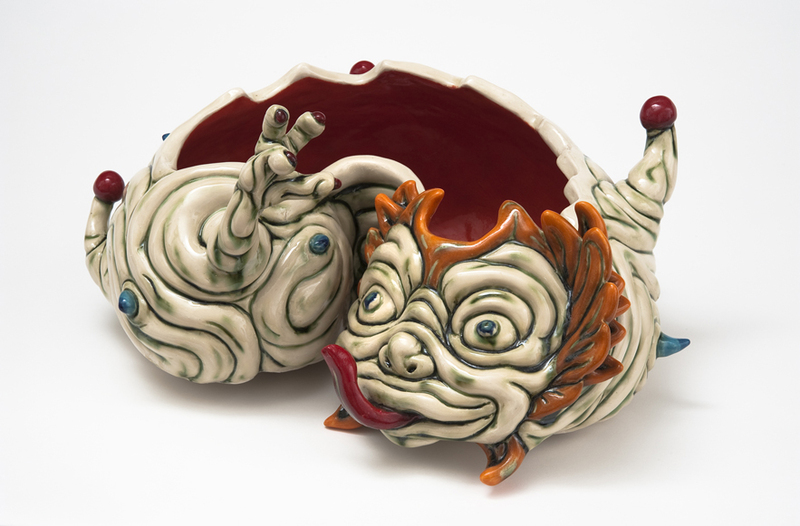 These pieces were made by wedging dark red or brown clay into white porcelain clay. After the pieces are built, they are scraped down to reveal the swirling patterns underneath. 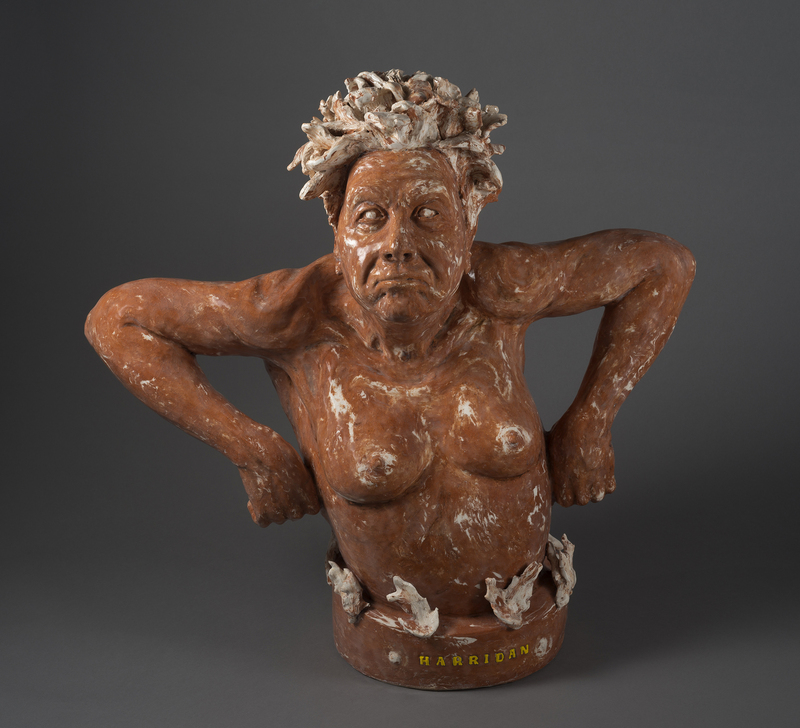 The first two images are of a portrait bust titled Harridan. A harridan is defined as a strict, bossy or belligerent old woman. My harridan is a figure of stubborn strength. Images three through nine are serpentine figures and harpies, related to Renaissance era patterns found in pottery and interior design. While making the pieces, I was thinking about femininity and maturity and how these could be understood within the context of the decorative grotesque. Harridan 30" x 27" x 18"
Worm 28" x 13" x 16"
Pretzel 20" x 28" x 15"
Indecorous Pair installed with wooden table, 36" x 48" x 30"
Harridan, 30"x27"x15", porcelain and terra cotta clay. 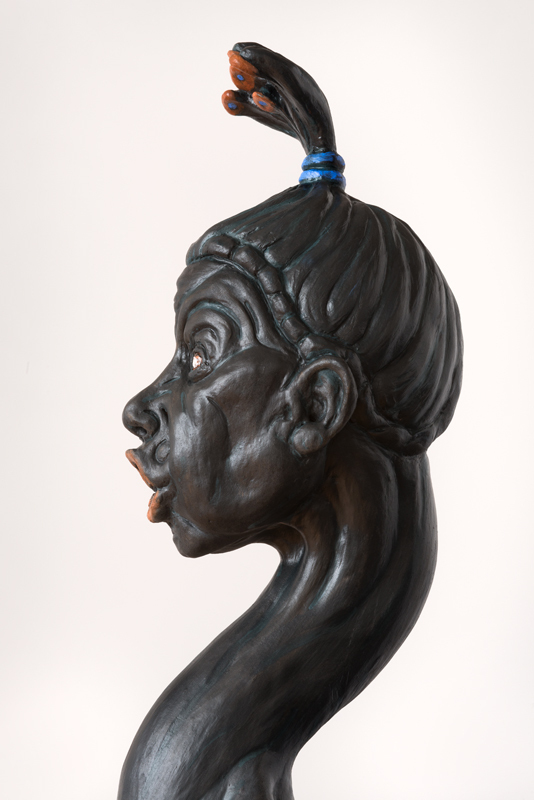 A profile view of Harridan, 30"x27"x15", porcelain and terra cotta. 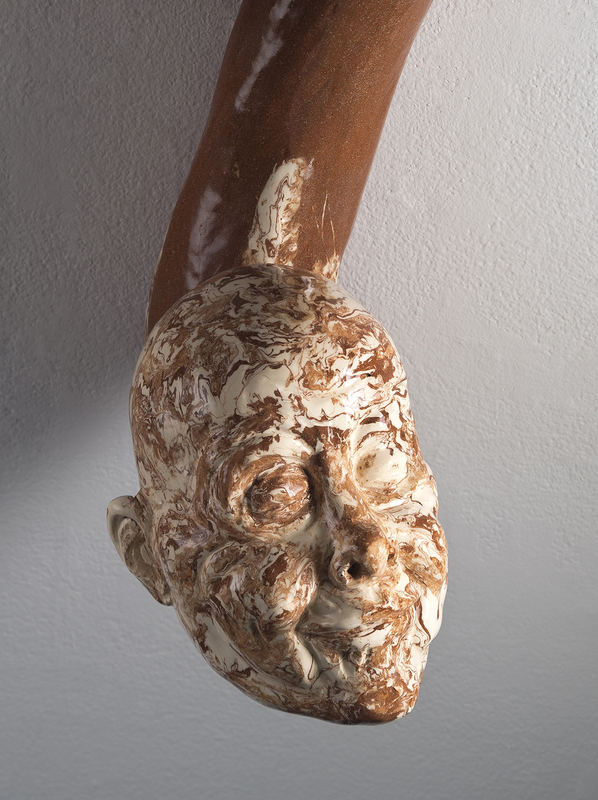 Terracotta, porcelain and iron hook, 28"x13"x16", 2014. 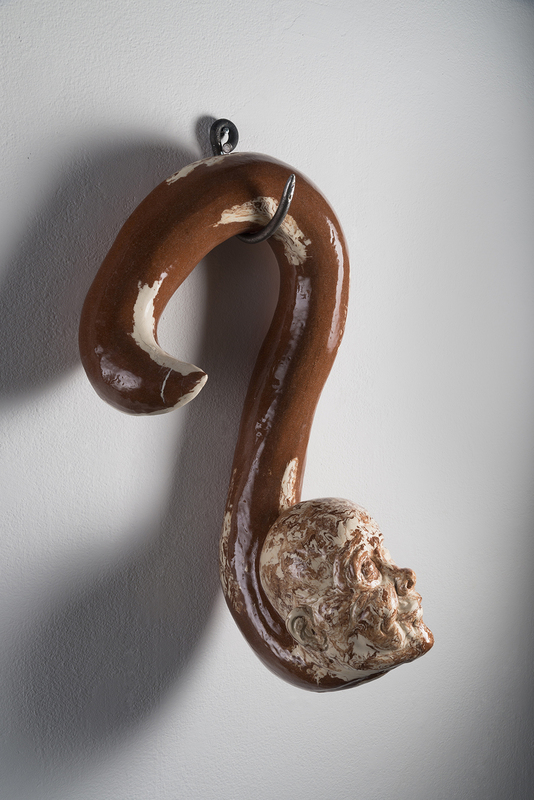 Terracotta, porcelain and iron hook. 28"x13"x16", 2014. 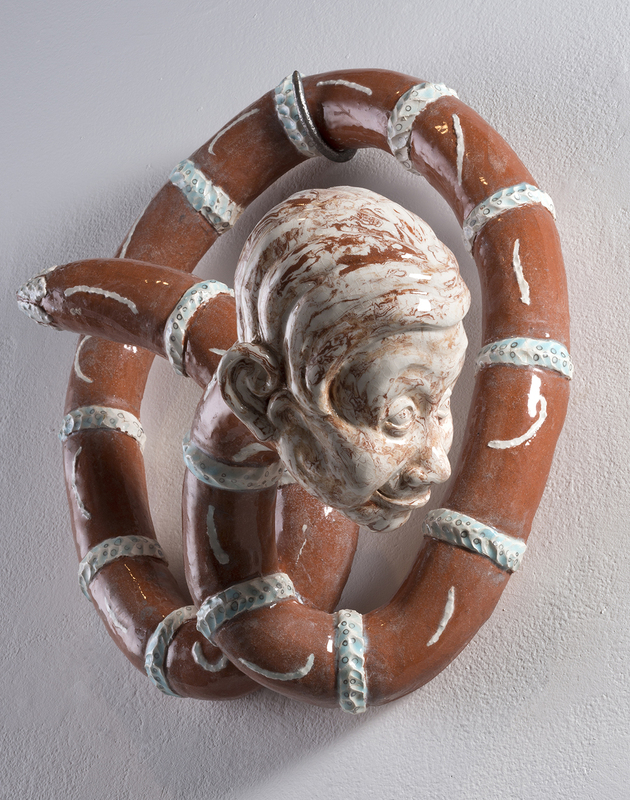 20"x18"x15", terracotta and porcelain clay, iron hook. 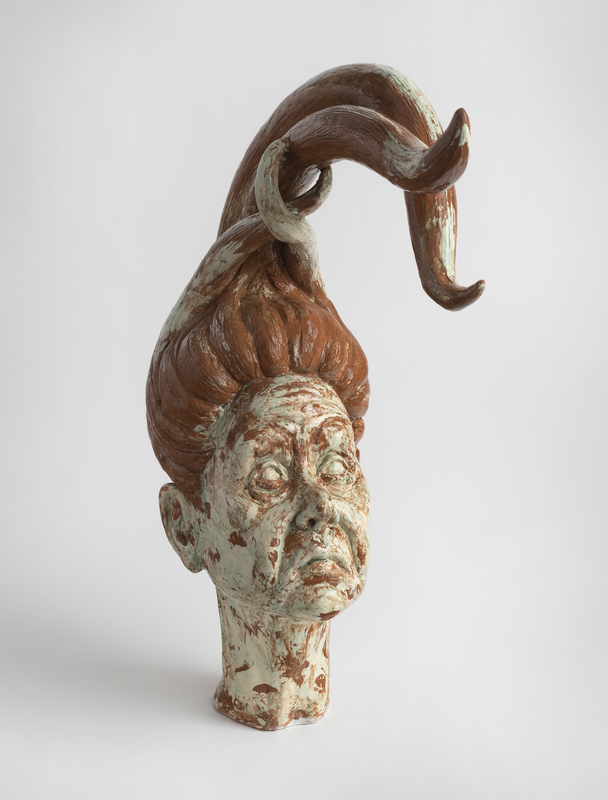 20"x18"x15", terra cotta and porcelain clay, iron hook. This pair of marbled harpies sail across a sky blue table, eyes closed with strange yellow blooms atop their heads. 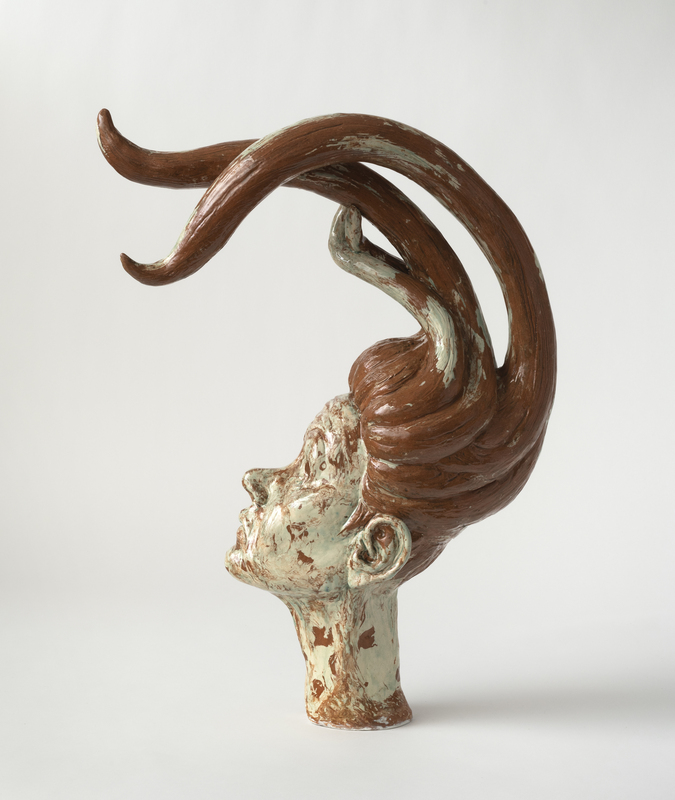 Porcelain and terra cotta clay, mixed media, 36"x28"x30". 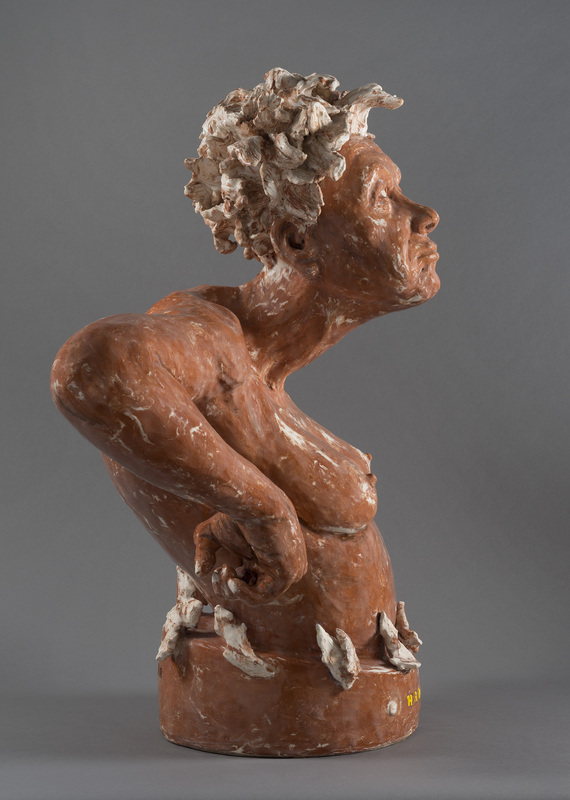 Porcelain and terra cotta clay, mixed media, 36"x48"x30." 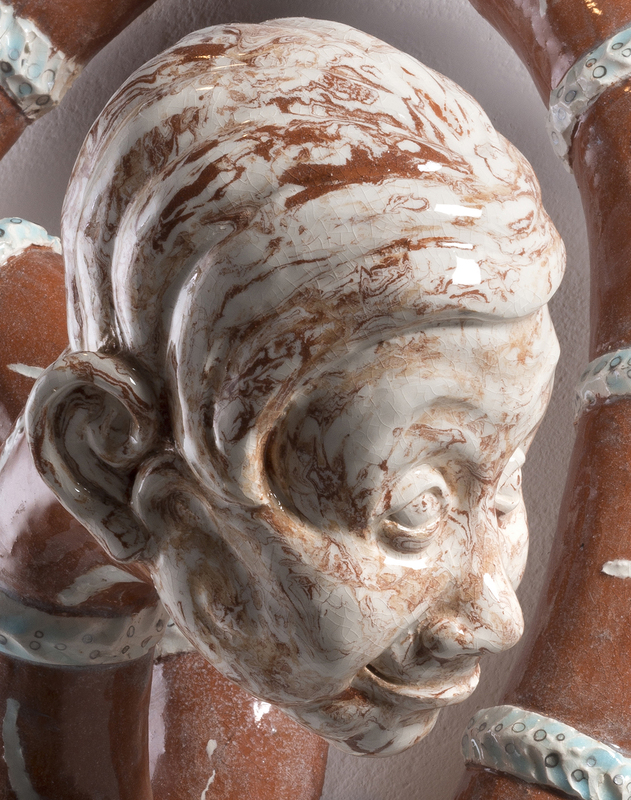 Detail to show marbled surface of porcelain and terra cotta. 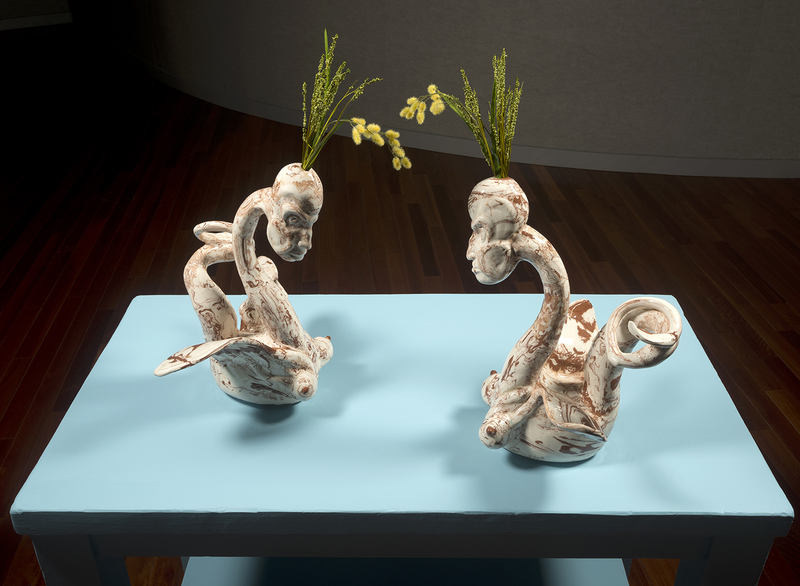 I was thinking about resiliency, even in defeat or capture, when I made these two life-size ceramic pieces. 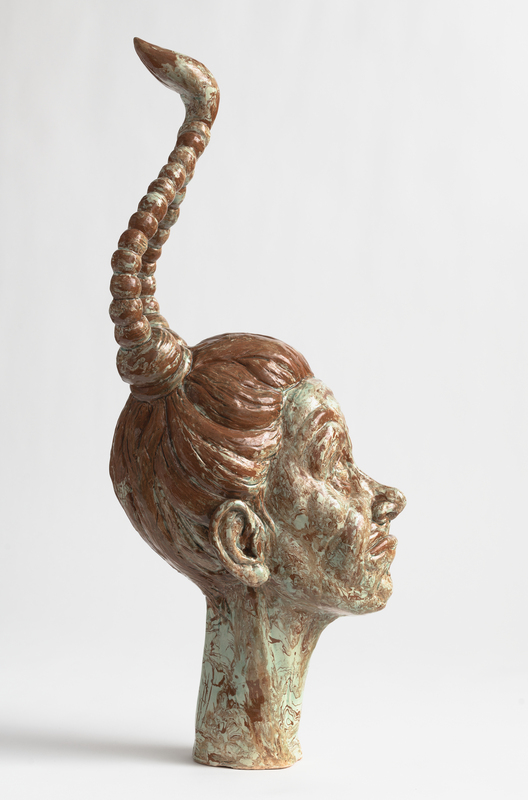 Both were also inspired by the anatomical distortions found in sixteenth century Italian sculpture and painting. After the Fall owes something to Cellini's sculpture Perseus Holding the Head of Medusa. 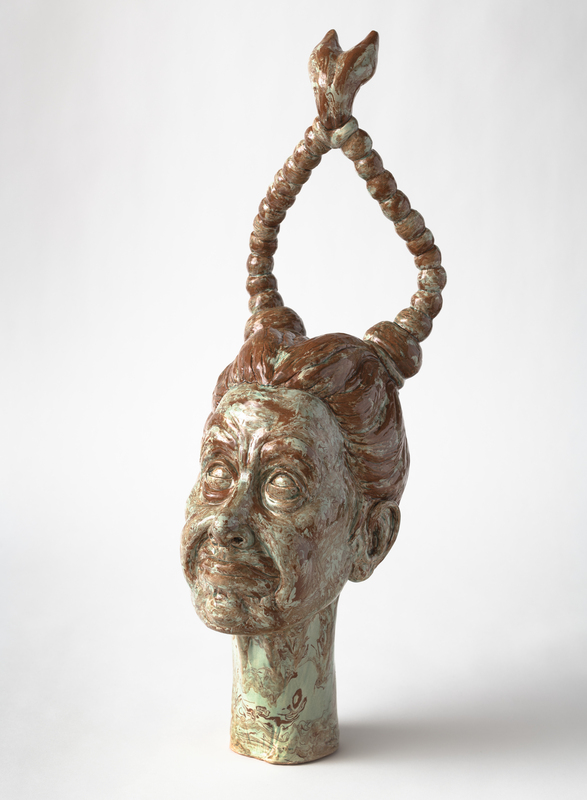 My figure is a topsy-turvy version of the medusa figure in this canonized sculpture. 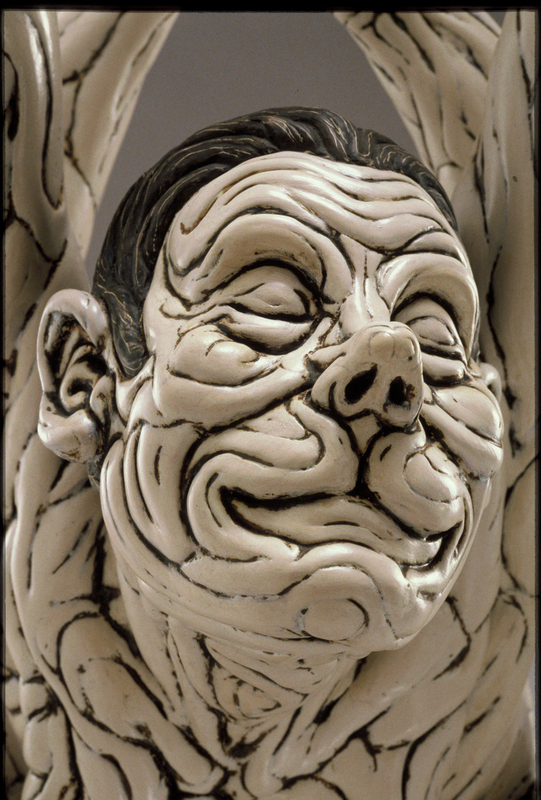 After the Fall's pale green surface (marked by accents of blues and pinks) is a result of porcelain clay being covered with fine, highly pigmented slips. After firing, I added varnishes to further deepen the colors. The highly saturated pastel colors are a nod to Luca Signorelli's 1502 fresco, The Damned, which depicts magnificent greenish-blue demons contrasted by the pink flesh of fallen souls. The second figure, Valor and Restraint, takes its title from the old adage, "Discretion is the Better Part of Valor", but replaces discretion with its double meaning synonym, restraint. Valor and Restraint has a rich, dark surface. 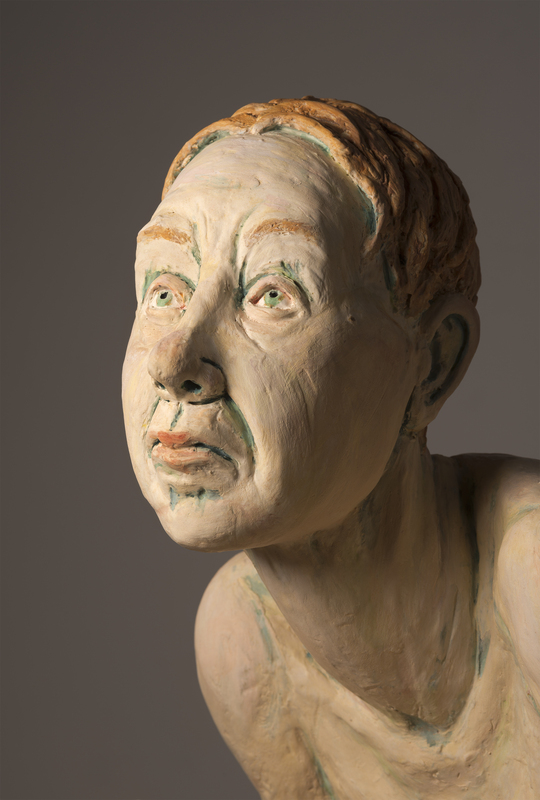 It was made from a red clay, which was then covered with layers of dark slips and stains before firing. The figure has the exaggerated long neck of many Italian grotesques. After the Fall 36" x 24" x 18"
Valor and Restraint 72" x 28" x 28"
After the Fall, 36"x24"x18", porcelain. 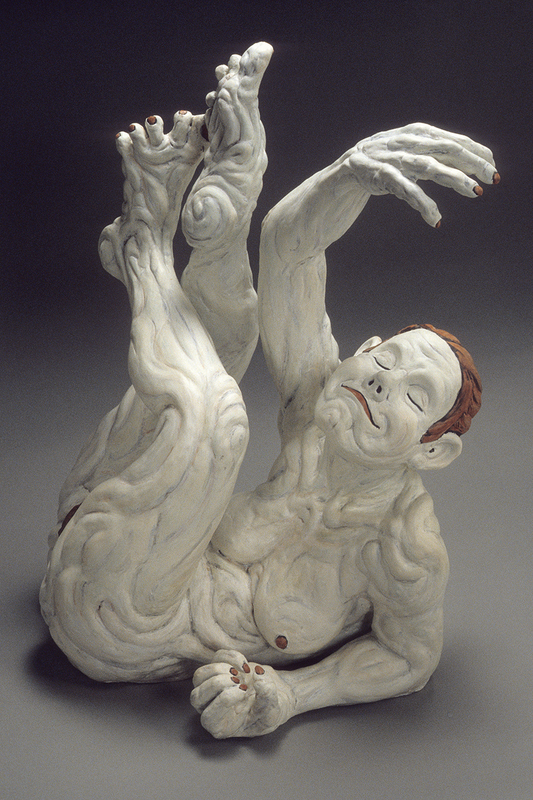 After the Fall, 26"x24"x18", porcelain. 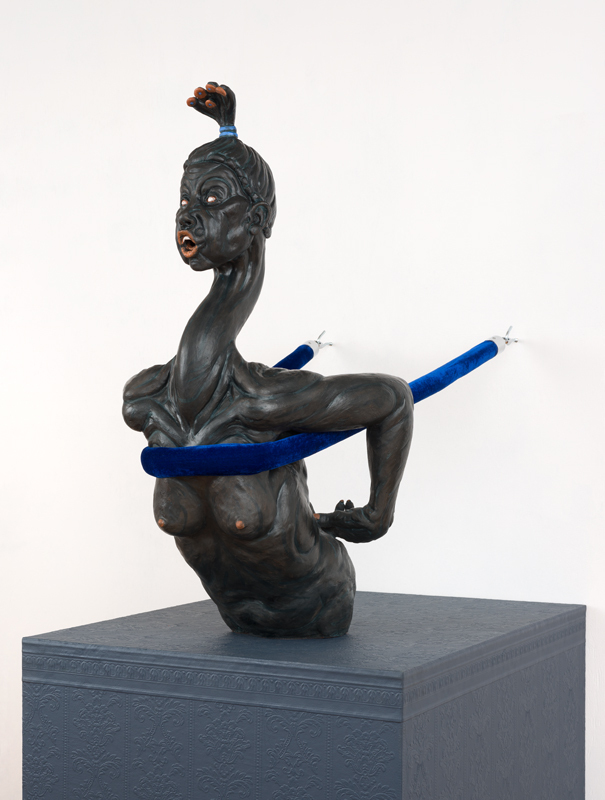 Valor and Restraint, 30"x65"x34", mid-range red clay, wall papered pedestal, velvet rope. 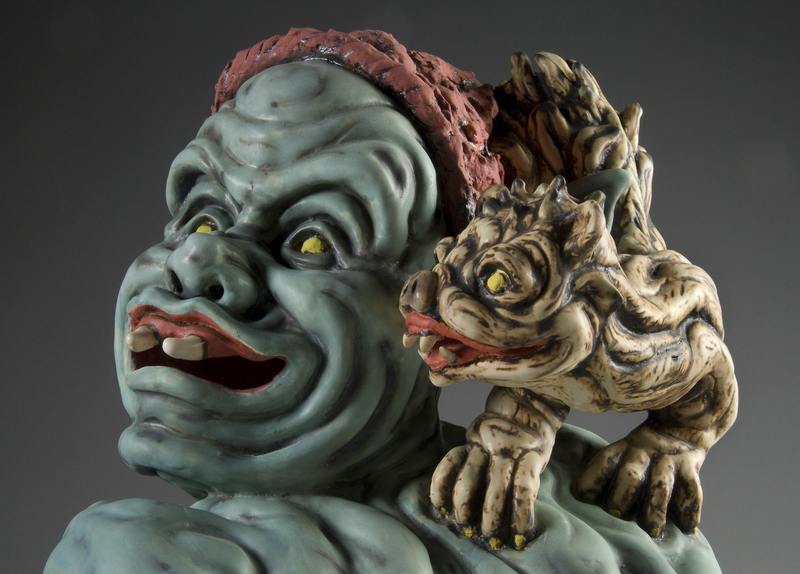 These two life size porcelain pieces offer two different takes on the fantasy of revenge. The blue-green figure, Comeuppance, has a face that merges Asian and Romanesque styling with a twisting Mannerist torso. 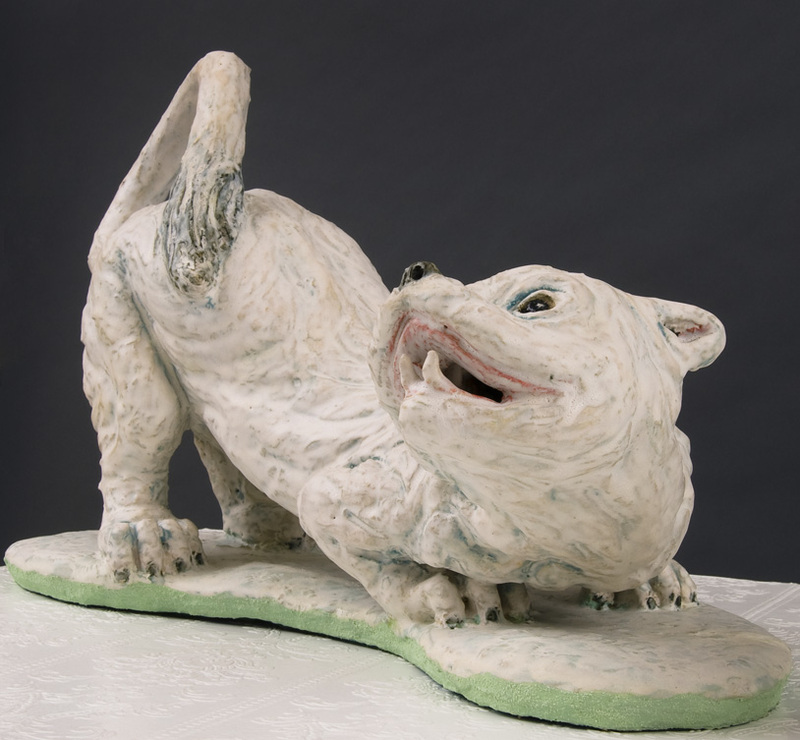 This piece flaunts both her own ample tail and a lively mink, which snarls from her shoulder. She is very much a monstrous femme fatale. 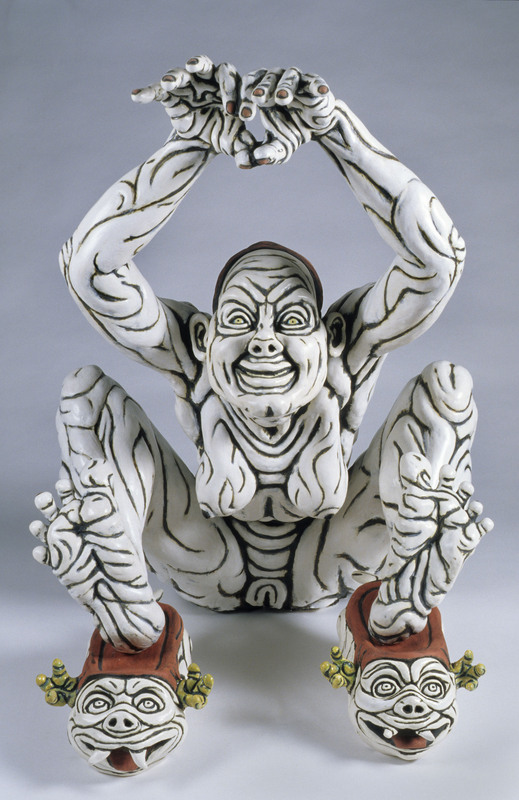 The white figure, Gonnagetu, combines a gleeful pouncing pose, a white Butoh-inspired body, a simple red kerchief and pigtails. Two animated ceramic footstools add to this triangulated grouping of forms. Her intent should be clear from her title. Comeuppance 36" x 22" x 24"
Gonnagetu 26" x 32" x 24"
These white figures in contorted poses were inspired by Butoh dance and my interest in upending the traditional vertical figure. 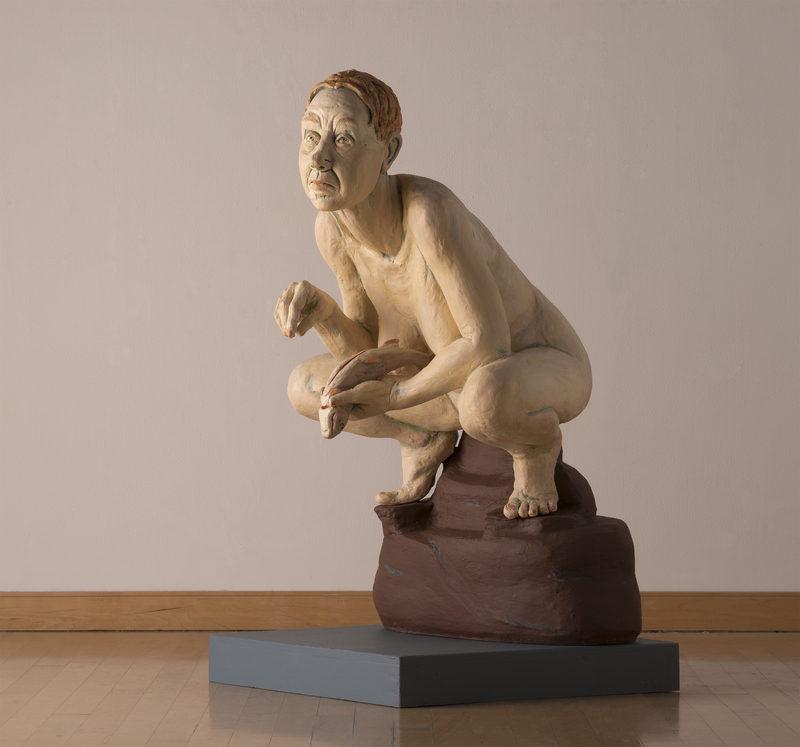 Youkai is in the Hermitage Sculpture Garden in Santa Barbara, California and Underfoot is in the collection of Dr. Lynn Franco in Berkeley, California. Both are sculpted in porcelain. 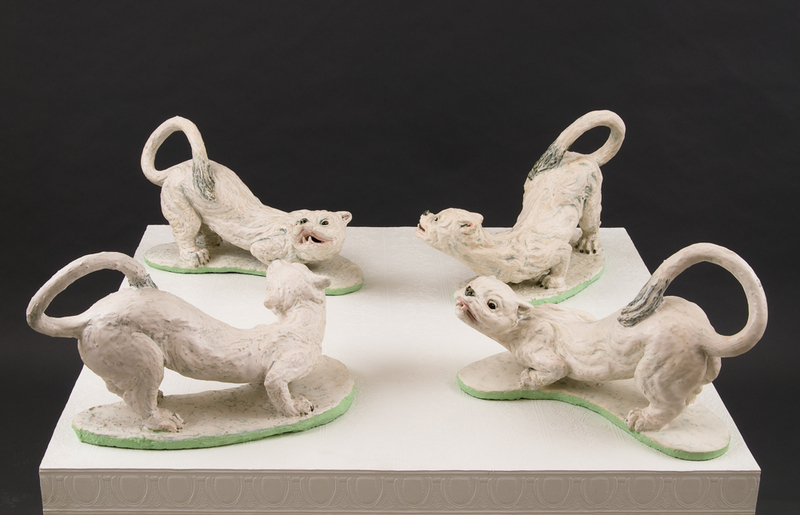 Four miming mustelids (or creatures from the weasel family) borrow from 19th century animal sculpture. I was interested in juxtaposing the domestic with the wild. Ferocity also fascinates me, especially in small packages. Materials: porcelain, wood, and wallpaper. The Stoats After Changing, 36"x28"x36", porcelain, wall papered pedestal. 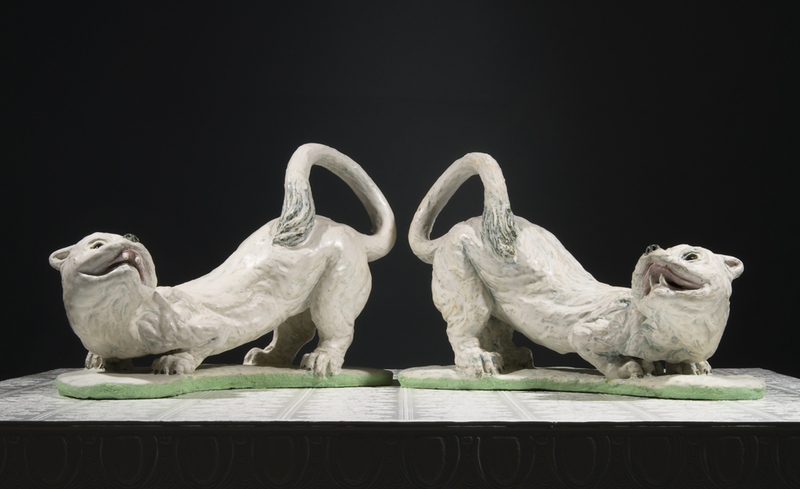 Pair of Stoats, 28"x12"15", porcelain, wall papered pedestal. Detail of a single stoat. 25" x 15" x10", porcelain, wall papered pedestal. 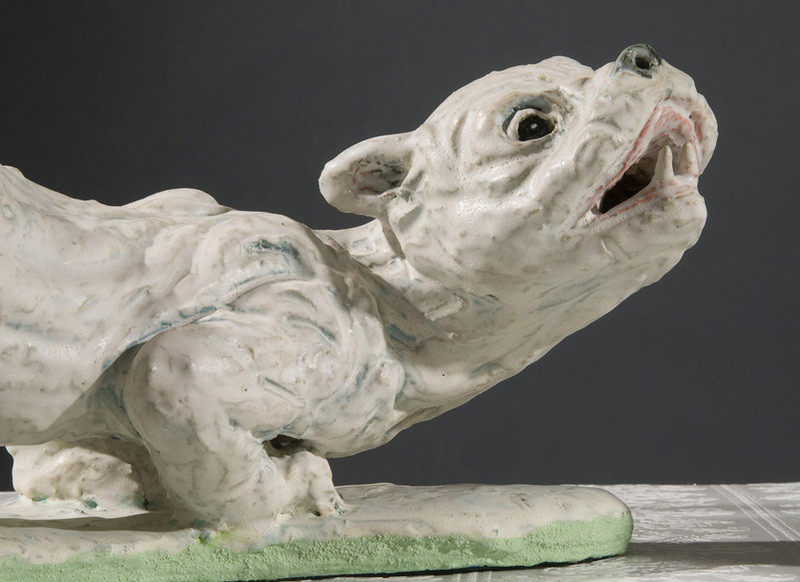 Detail of a single stoat, 25" x 15" x 10", porcelain, wall papered pedestal. These are my nod to functionality (and fun). 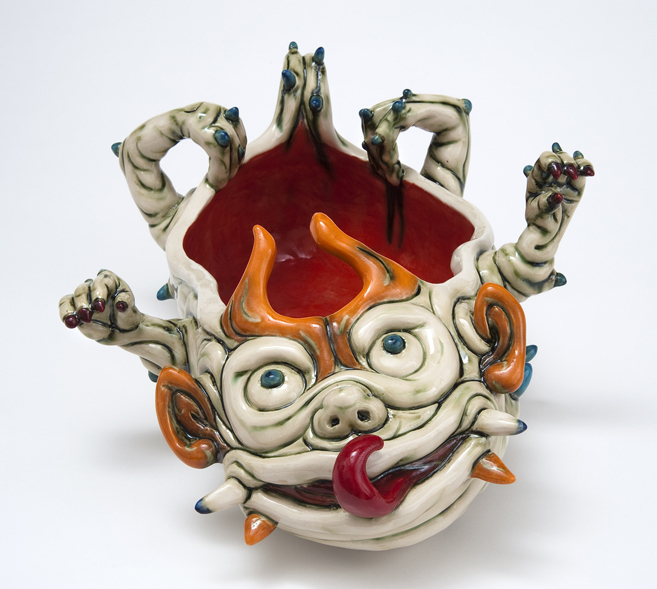 They are influenced by Chinese sculptures of "auspicious beasts" and Northwest Coast carved potlatch vessels. 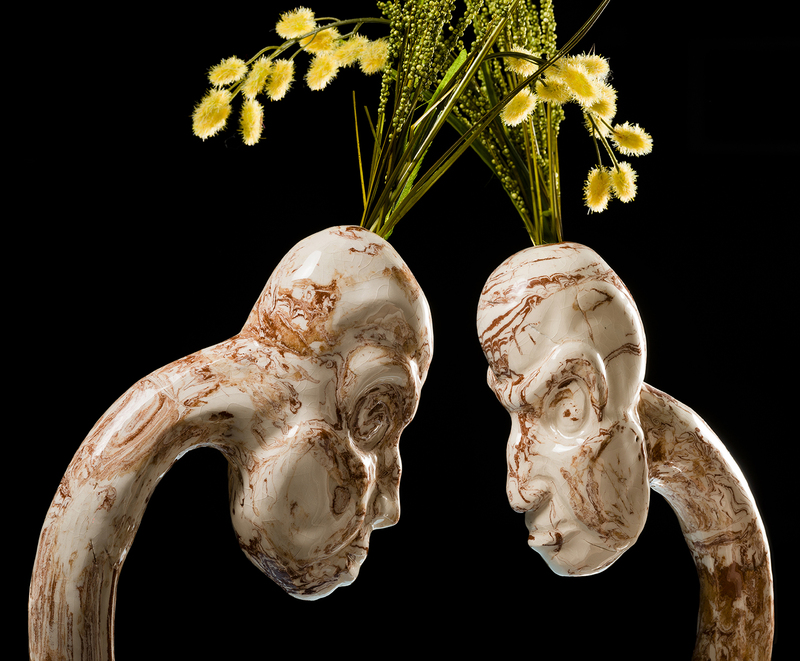 They are sculpted in porcelain. Underglazes and oxides are applied before a clear glaze. Dimensions: 13" to 15" long. 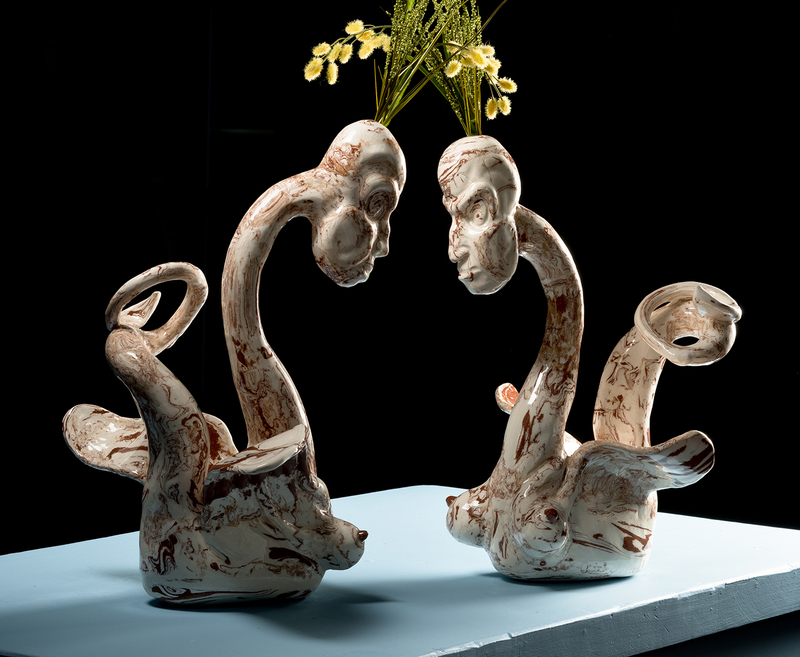 Potlatch Trio, 30" x 10" x13", porcelain. 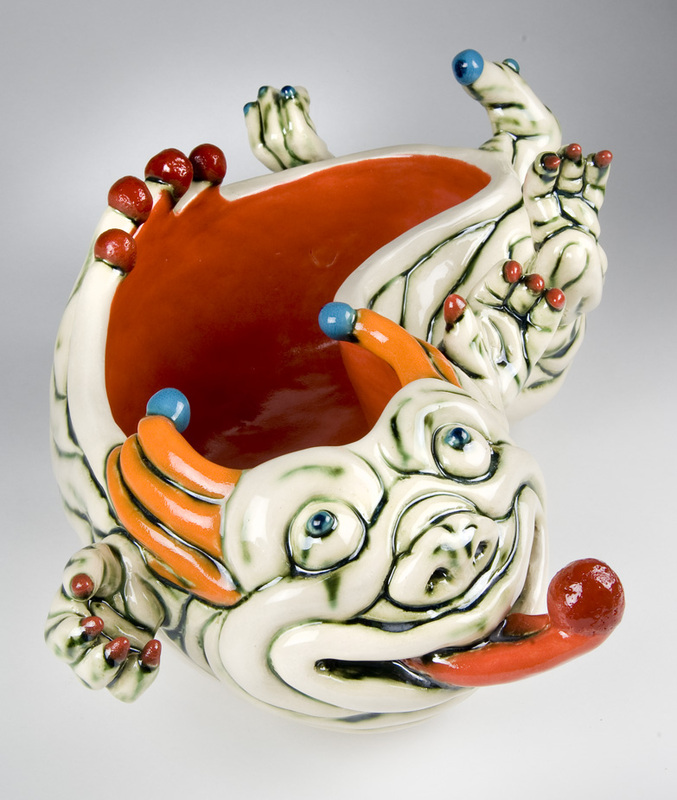 Potlatch 5 (Joe's Beast), 13"x10"x8", porcelain. 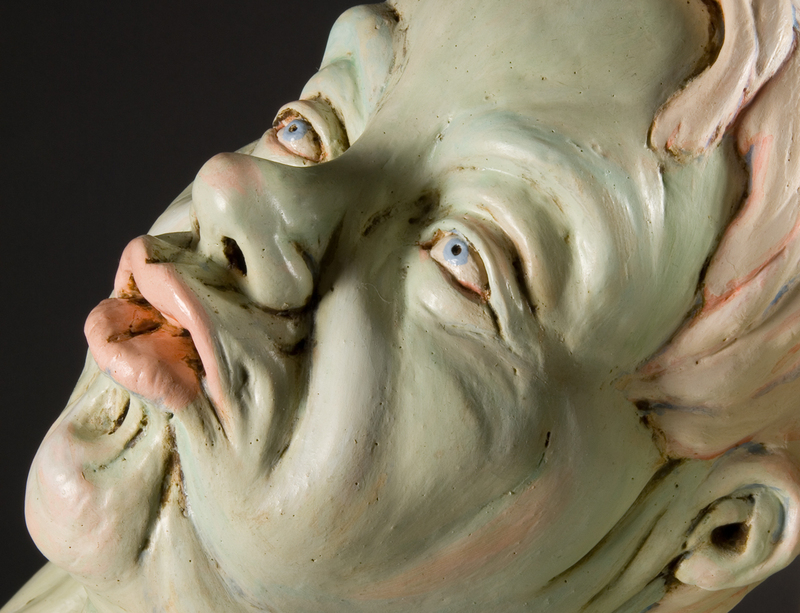 In 2001 David Friedheim and I founded Grendel's Mother to create collaborative sculpture. We have produced many large scale works in a variety of materials. 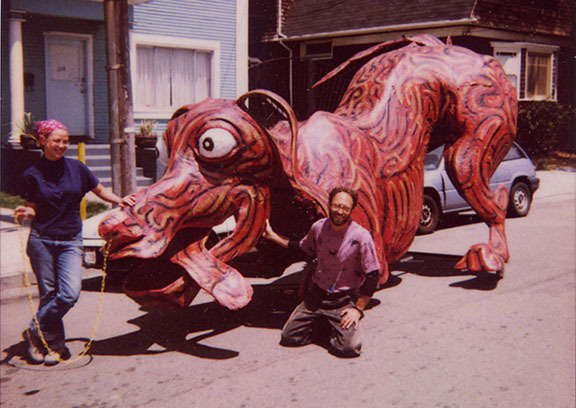 Big Red Dog - This is where the collaboration of Kyner-Friedheim began, with the building of steel and paper mache parade floats for the Fire Arts Festival at The Crucible, Berkeley, CA., in 2001. Both of us were teachers at this school for fire-based arts, and the Big Red Dog was built with the help of our students. 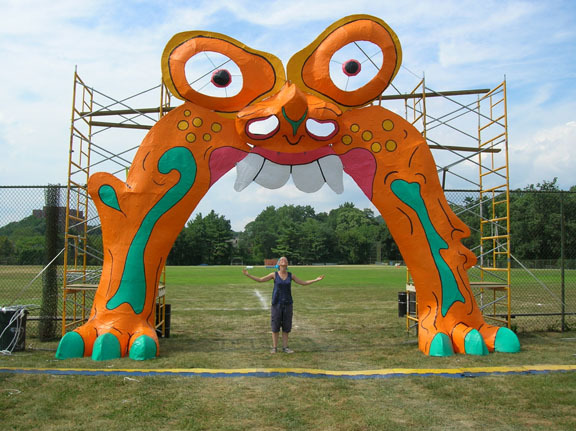 Monster Arch - This twenty foot high sculpture was commissioned by the City of Baltimore for the 2006-7 International Festivals. It was built by Kyner-Friedheim with help from city employees and community volunteers. 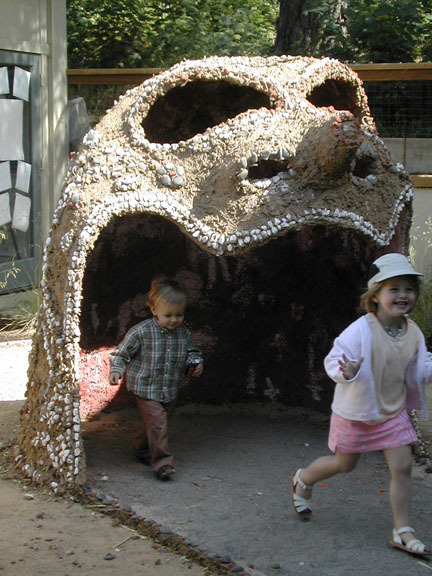 Mud Head - This cob and steel playhouse was originally built in 2004 with students at Horizon Elementary school in Mill Valley, CA. In 2008, it was rebuilt at Baltimore​Clayworks with the help of community volunteers. 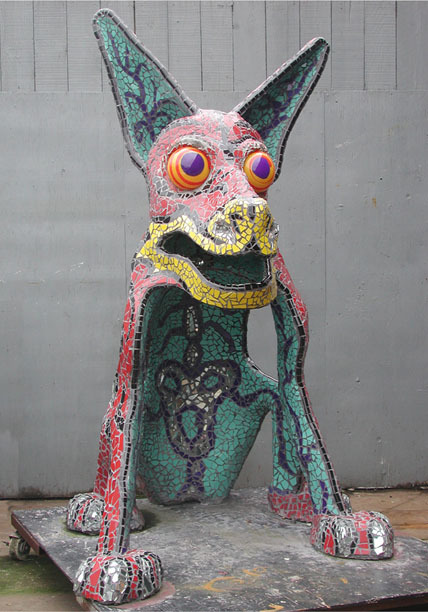 Poochifer - Built in 2004 with a host of community volunteers, this eight foot tall steel, cement, blown glass and tile sculpture had a brief brush with fame when it was rented for a backstage party for the singer Bjork. It now resides in Santa Rosa, CA. 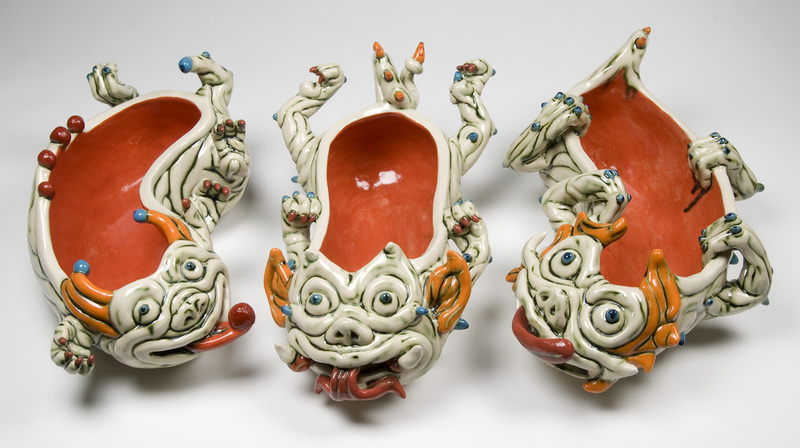 Zotz - This fun fur, fabric, steel and porcelain piece was originally commissioned by the Legion of Honor Museum in San Francisco for its 2004 Dia de Los Muertos Exhibition. It was built by Kyner-Friedheim, artist Sarah Lowe and a host of volunteers. It was rebuilt in Baltimore and displayed at CCBC, Dundalk as part of Artscape 2008. 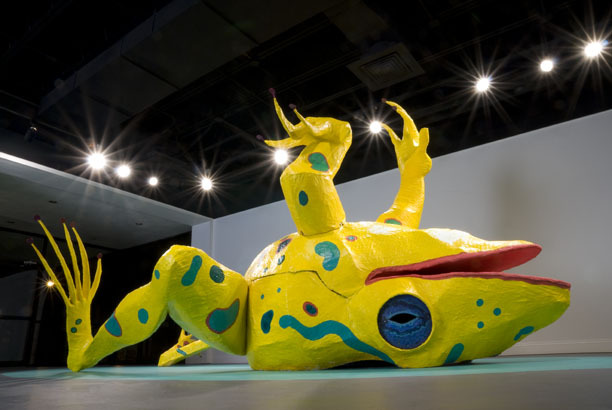 Frog - The fifteen foot long, upturned Frog was built by Kyner-Friedheim with assistance from CCBC and MICA students. 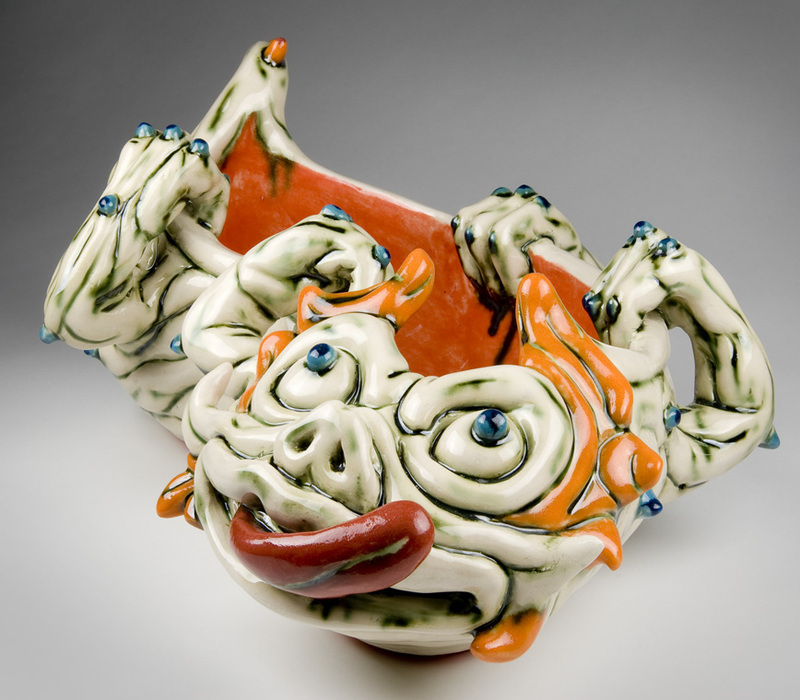 It was exhibited as part of Grendel's Mother's solo exhibition at CCBC, Catonsville in 2008. It has since been shown at Coppin State University. Pink Rabbits, Chameleon and Duck- These sculptures were originally created to be on stage during a series of performances by the dance troupe Galumpha at The Kennedy Center For the Performing Arts in January of 2010. 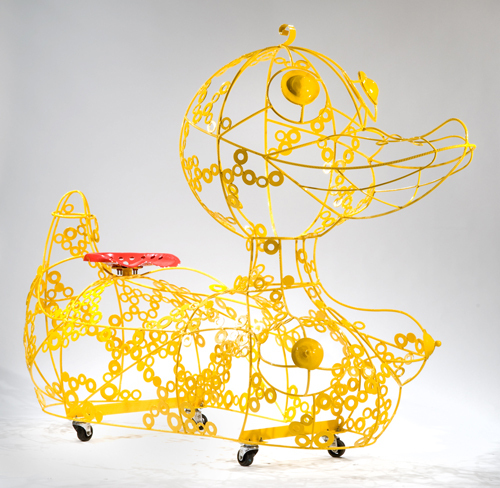 In the spring of 2010, they were shown in the exhibition "Child's Play" at CCBC, Catonsville. In subsequent years, The Chameleon has been shown at the Ellicott City Courthouse (as part of Howard County's ARTsites program) and at Baltimore Clayworks. The Pink Rabbit has proved popular, and we have sculpted several versions. The original appeared on Mt. Royal Avenue in Baltimore as part of the exhibition "Here, There and Anywhere" for Artscape 2010. Later this first Rabbit was shown at the Howard County Public Library in Maryland (as part of Howard County's ARTsites program), and on Main Street in Carbondale, Colorado (as part of Art aRound Town, sponsored by the Carbondale Public Art Comission.) The original finally found a home when it was purchased by a private collector in Carbondale, CO in 2013. 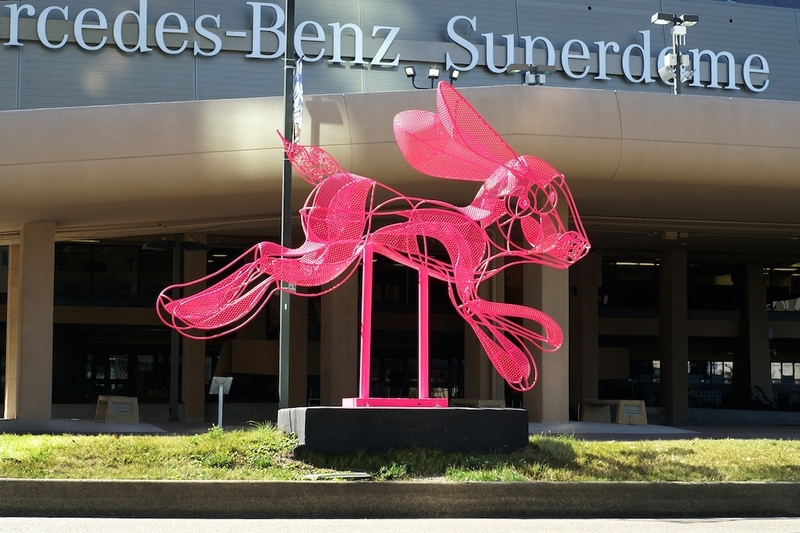 A second Pink Rabbit was installed in December of 2013 in front of the Super Dome in New Orleans as part of "Sculpture for New Orleans." After its two year run in New Orleans came to a conclusion, it was purchased for the nearby city of Kenner, Louisiana. A third Pink Rabbit was made for a client in Florida, and a fourth version has taken up residence at the Columbia Mall in Maryland. Each version is slightly different. 7'x7'x7.5', cob over steel armature. This piece was first built with school children in California in 2004 and then rebuilt with community members at Baltimore Clayworks in 2008. 9'x8'x6', steel, blown glass, mosaic tile, 2003. Created with friends, students and fellow artists in Oakland, CA. 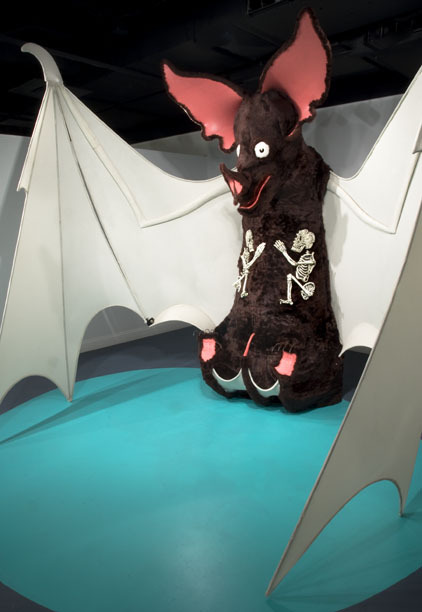 Zotz (Mayan for "bat"), 8'x11'x10', steel, fun fur, fabric, porcelain, 2004 and 2008. Zotz was first built in California with collaborating artist Sarah Lowe and a host of friends. It was shown at the Legion of Honor Museum in San Francisco. Zotz was rebuilt in Baltimore in 2008 with the help of students and friends. Zotz was shown in Baltimore's 2008 Artscape. 14'x 8'x 8', steel, fabric, paint, 2004. Built with friends and students in Baltimore. 6'x3'x6', steel pull toy. First designed for dance performance by Galumpha at Kennedy Center For the Arts, Washington, DC. Second Pink Rabbit, installed in front of New Orleans Superdome as part of Sculpture for New Orleans. Now owned by the city of Kenner, New Orleans. Chameleon, steel, twelve feet long, on display at Baltimore Clayworks as part of the Sondheim Exhibition, summer of 2018.